Sony is officially the last one to the PMA DSLR party, getting real with the A300 and A350 DSLRs we glimpsed earlier. The entry-level 10.2MP A300 (same CCD sensor as the A200, $800 w/lens) snaps away at "about 3fps," 100-3200 ISO, built-in image stabilization (vs. Nikon and Canon's lens approach) and indeed sports that oddball 2-way tilt screen for live view—good for semi-discretely shooting from your crotch, Chen-style. The A350 has the same features, but packs in 14.2MP (hey Sony, not the highest in its class), fires at 2.5fps in continuous shooting and will run $800 for the body. 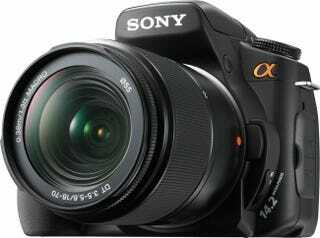 SAN DIEGO, Jan. 30, 2008 - Sony is bringing live-view shooting to its digital SLR camera line with today's introduction of a 14.2-megapixel  (alpha) DSLR-A350 camera and 10.2-megapixel α (alpha) DSLR-A300 model. Both cameras feature new technologies that make picture taking faster, easier, and more familiar for first-time DSLR users. They both offer Sony's new "Quick AF Live View" technology so you can frame photos on the camera's LCD without sacrificing auto-focusing speed common to other live-view systems. Sony's innovative Pentamirror Tilt mechanism directs light to a dedicated live view image sensor, enabling fast and responsive TTL phase-detection auto-focusing, even during live view. Eliminating the focus delay of other systems, the new models are equally responsive whether using live view or optical viewfinder. With its two sensor design, Quick AF Live View can even continuously focus-track the subject and provide live view during burst shooting, helping you capture that special moment. Taking further advantage of Quick AF Live View is the models' variable angle 2.7-inch Clear Photo LCD ™ screen. This makes it easy to frame scenes from high or low positions difficult to reach when using an eye-level viewfinder. With Live View and an adjustable LCD, the cameras do not need to be in front of the user's face, allowing parents, for example, to maintain eye-contact when photographing their children. "Mainstream users stepping up to DSLRs are looking for a similar experience to their point and shoot cameras, but without compromise in speed or performance" said Phil Lubell, director of marketing for digital cameras at Sony Electronics. "Quick AF Live View gives these new models a familiar shooting style without compromising speed - ideal for the growing market of first-time SLR users." The new models produce images with fine detail, rich tonality and vibrant color due to their APS-C CCD image sensors and BIONZ® processing engine. To aid shooting in low light, Super SteadyShot® image stabilization enables shutter speeds 2.5 to 3.5 steps slower than otherwise possible, with every compatible Minolta Maxxum® and Sony α (alpha) lens (sold separately) attached to the camera. High sensitivity operation at ISO 1600 and 3200 and very low noise are made possible by the user-selectable high-ISO noise reduction features. Sony's D-Range Optimizer delivers suitable tonality and exposures with rich shadow and highlight detail, even under high contrast situations. The DSLR-A300 model can shoot about three continuous frames per second and the DSLR-A350 model can shoot up to two-and-a-half continuous frames per second, when using the optical viewfinder. Both are powered by the Bionz processing engine and supplied InfoLITHIUMTM battery for fast start-up times, quick response and long battery life - up to 730 shots per full charge when using the optical viewfinder and up to 410 shots per full charge in live-view mode. Both models feature lighter, slimmer bodies for easy handling; an improved user interface; an automatic pop-up flash; a comfortable camera grip with an easily accessible mode dial; an anti-dust system to keep the CCD image sensor clean for spot-free pictures; and JPEG and RAW file format support. Both have a slot for CompactFlash™ Type I/II media cards. An adaptor for Memory Stick Duo™ media cards is also available for the cameras and sold separately. The new DSLR-A300 and DSLR-A350 cameras are compatible with a range of accessories, including the ergonomic Sony VG-B30AM vertical grip. Also available as an option is the new Sony HVL-F42AM flash unit. It offers advanced features such as automatic white balance adjustment with color temperature information, adjustable bounce angles, ADI metering and wireless remote operation to suit the needs of most photographers. The DSLR-A300 kit with a DT 18-70mm f3.5-5.6 standard zoom lens will ship in April for about $800. The DSLR-A350 camera body will be available in March for about $800, and the DSLR-A350 kit with a DT 18-70mm f3.5-5.6 3.9x zoom lens will be available for about $900 at the same time. Both models will be available at sonystyle.com, Sony Style® retail stores (www.sonystyle.com/retail), military base exchanges, and authorized dealers nationwide. Pre-orders begin online today at www.sonystyle.com/dslr.